Rescued Golden Retriever to your family! *for the first adopted senior. Subsequent senior adoptions are fee free. **Why are fees higher for Turkey Dogs? The costs of rescuing dogs from overseas (Turkey, Korea, etc.) are much higher than the normal cost of rescue due to the transportation costs incurred getting them safely into rescue. 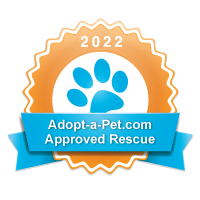 The adoption fees charged only help offset the cost and do not cover the full cost of their international rescue.